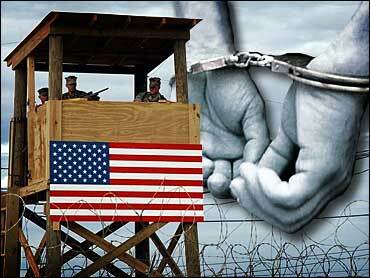 This is the second in a two-part series about the fate of the Guantanamo Bay detainees. In Part I, CourtWatch focused upon the government's overstated description of the prisoners as "killers." Part II offers one legal and political solution to the problem of how to fairly and quickly process the men out of the base. Now that we know, from the military's own records, that the vast majority of Guantanamo Bay detainees are not the "killers" the administration has told us they are, we still need to decide as a nation what to do with the men. Last week, congressional hearings were held to discuss and debate how far the executive and legislative branches are willing to go to comply with the judicial branch's declaration last month, in the form of a Supreme Court decision, that the prisoners must be given significant due process rights. On the one hand, we have the administration, which wants Congress to explicitly endorse the military's existing plan to process the men through a "military commission" that seeks to dramatically limit the prisoners' ability defend themselves. On the other hand, we have some influential members of Congress, and not a few legal and military scholars, who believe that the detainees can be fairly (and safely) prosecuted using a slightly modified version of the Uniform Code of Military Justice, which our military uses to discipline our own soldiers. The White House says the Gitmo prisoners are not just ordinary soldiers or low-level criminals, but terrorists, too. As a matter of raw prudence, the administration argues, not to mention legal and historical precedent, terror suspects should not be allowed a legal process that allows them access to anything other than a shadow of the evidence against them. Congressional critics say that existing courts-martial rules already take into account sensitive, national security-type matters and that they can easily be adapted to both protect classified material from being revealed and give the prisoners an opportunity for a meaningful defense. Here is my plan. It is as simple as it will be considered controversial, but all it really does is allow the "facts on the ground" to dictate the legal course we ought to take. For that to occur, first, Congress and the White House must acknowledge that the evidence varies greatly against and among the detainees. There is solid and serious evidence against some of the men. And there is little against many others. The law and our policy must recognize these vast differences. Some detainees clearly do pose a threat to our safety. Many others, it is clear from the government's own evidence, do not. Because the evidence against the men falls along a sliding scale, just as it does with criminal defendants in the regular world, it seems to me that the procedures employed to prosecute the detainees should "slide" as well. We sometimes handle felony prosecutions differently from misdemeanor prosecutions, right? Capital defendants get more appellate review than do other murder defendants, right? Our nation's "equal protection" jurisprudence may, in the right circumstances, permit unequal treatment of people who are differently situated. Put another way, the law doesn't require the government to treat differently-situated people the same. Let's get into specifics to see how it plays out. According to "The Guantanamo Detainees: The Government's Story," a research project conducted by two attorneys (one of whom is a Seton Hall professor) for the detainees, the government last year questioned the prisoners as part of a "Combatant Status Review" to determine whether the men ought to be considered as "enemy combatants." Military officials also had (and have) access to the other evidence against the men, of course. The factual basis for our compromise rests upon the pillars of this raw data compiled at Gitmo. As noted in Part I of this series, and according to the Seton Hall report, 55 percent of the Gitmo detainees were deemed by our own government "not to have committed any hostile acts against the United States or its coalition allies." Only "8 percent of the detainees were characterized" by our military "as al Qaeda fighters. Of the remaining detainees, 40 percent have no definitive connection with al Qaeda at all and 18 percent are (sic) have no definitive affiliation with either al Qaeda or the Taliban." On the other hand, the Seton Hall report tells us that "the evidence satisfactory to the Government for some of the detainees is formidable ... 11 percent of the detainees met with Bin Laden" and that there is evidence at Gitmo that a "small number of detainees ... played important roles in al Qaeda." These men, the report indicates, have been portrayed by military officials in their Combatant Status Review as "powerful, dangerous and knowledgeable men who enjoyed positions of considerable power within the prohibited organizations." These men, the ones who fit into this second "powerful and dangerous" category, however many there are, should be afforded the "least" amount of due process when it comes their turn for trial; provided, however, that the "evidence" upon which the military's assessment has been made against them is itself reviewable by some sort of independent arbiter. For these men, something close to what the Bush administration initially proposed as its "military commissions" may be appropriate with only a few modifications. Those relatively few who best fit the "terror suspect" label, in other words, will be treated that way as the administration wishes. On the other hand, detainees like the one whose only "crime" seems to be that he was a "cook's assistant" for the Taliban who surrendered to the Northern Alliance should be given broader rights to challenge the evidence against them. In other words, absent that initial showing by our military that the men possess some direct or distinct or real connection to al Qaeda or other terrorist organizations, there ought to be less concern about trying any of the remaining detainees using rules that permit the men to gain some sort of access to the evidence against them, to attend their own trials, and to have their attorneys get security clearance to see classified information. The hundreds of Gitmo prisoners who least fit the "terror suspect" label will be treated as the hapless Taliban soldiers that they were. I know what you are thinking — that this solution puts the cart before the horse by identifying and then classifying the culpability of the men before they have their trials. But that classification itself, and the impact it has on the rights of the men going forward, is the compromise that gets us out of this legal and political morass and, ultimately, gets us out of the prisoner-business at Guantanamo Bay. By deferring to the military's initial evaluation of the threat posed by the men, we are able to focus our concerns about national security (or future terror attack, or whatever else the administration is concerned about) upon the relatively few detainees who warrant it the most. And, by contrast, we are able to quickly move forward with courts martial for the hundreds of other men not deemed by our military to be "powerful" and "dangerous." The White House and Congress should set up a committee to determine precisely which men fall into which category (using, again, the military's existing evaluations as their sole guide). The administration should be bound by those initial review evaluations of the detainees — no coming in now and ginning up more serious "evidence" to get a larger group of the men into the "more serious" class of prisoners into which we have just divided the detainees. And the Congress should authorize for these relatively few men only the White House's military commissions, with a few due process tweaks, most notably that independent post-trial review. A compromise like this is even remotely possible only if our elected officials, and the federal lawyers who so far have gotten us into this terrible mess, have that "Come to Jesus" moment when they candidly acknowledge that hundreds of the detainees held in Cuba do not truly pose a threat to our national security now and will not do so even if they are tried by our courts-martial. It's possible only if the Congress gins up the spine necessary to refuse to accept the current status quo (and empty rhetoric of White House officials). It is, simply put, time to let the facts — as the military itself sees them — dictate how this lamentable story plays out under the law. There is only one way out of Guantanamo Bay — the truth sets everyone free. Not literally, of course.